I februari 1931 bildades Snättringe Sportklubb, när 10MILA nästa år avgörs i Göteborgstrakten är vår klubb således 86 år gammal. Detta uppmärksammar vi genom en satsning mot 10MILA 2017. The cold and dark winter is close and maybe some of you need some extra motivation to train during that time. Well here it comes! Our goal for next years 10mila is getting a position lower than 86. Why 86? Because Snättringe SK will be 86 years old next year. To achieve that high goal we need to train hard. Everybody needs to improve to be able to achieve that. Therefore we set a goal of 86h (or more) of running training until 10mila. Starting at the 1st of November. To reach that number you need to train at least 3h21min each week. The goal is NOT to train as much and hard as you can for some weeks, but to get consistent numbers of running hours each week. So dont overdue it the first weeks and try to train smart and play with duration and speed. If you are willing to do this, please let us know. We will write your name on the picture so there are no excuses afterwards. 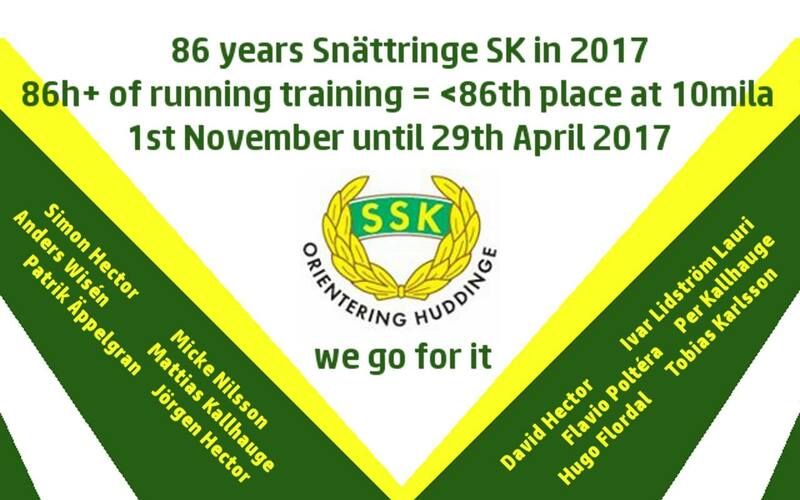 See you in a good shape at the 29th of april 2017 in göteborg partille to reach a place better than 86.